AtlantiCape Inspections, LLC, sister company of Integrity Engineering, LLC, provides home inspection services in Stone Harbor, NJ and the surrounding communities. We offer you prompt scheduling and report generation at competitive fees, performed by a New Jersey-licensed home inspector who is also a NJ & PA licensed engineer. To schedule a home inspection, condominium inspection or commercial inspection, call (609) 487-7757 or e-mail Zack@AtlantiCape.com. Following your inspection, your completed inspection report will be completed and delivered late the same day by e-mail; a paper copy, if desided, will follow shortly thereafter if requested. Home or commercial real estate inspections will be performed by I. G. "Zack" Lilienfeld, P.E. Zack offers prompt, professional inspection and consulting services, using state-of-the-art tools and resources. As a Licensed Home Inspector, Zack is fully insured, with the state-approved credentials that you should expect in a professional. He is also a Licensed Professional Engineer in New Jersey and Pennsylvania, with over 33 years experience performing building surveys. Zack offers a high degree of professionalism, thoroughness and dedication to the needs of his clients. If you are a home or business owner or buyer looking for prompt, personal service in the Wildwood, NJ area, then please contact us at (609) 487-7757 or e-mail Zack@AtlantiCape.com. 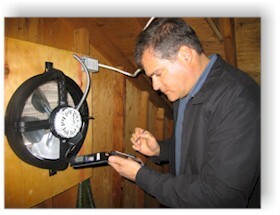 Click on the town above to find out about AtlantiCape's home inspection services the area you desire. Note: If you would like a home inspection in an area not listed above, please give us a call at (609) 487-7757. Why Pick a Licensed Inspector?